If you can’t beat ‘em, acquire ‘em. Garmin, maker of personal navigation devices, has snapped up its Germany-based competitor Navigon. The companies won’t say how much money is changing hands in the deal, which was completed through a Garmin subsidiary. 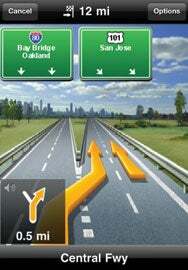 Navigon sells a variety of popular navigation apps for both iOS and Android under the MobileNavigator app name; that makes it an attractive purchase target for Garmin, given that sales of standalone GPS units have dropped in recent years, thanks to the rise of GPS-enabled smartphones. Garmin’s own smartphone venture has perhaps not fared as well; its sole app is the second highest grossing iPhone navigation app, but four of Navigon’s apps make the top 20 for the category, and its offerings also sport higher ratings. Both Garmin and Navigon also do business as original equipment manufacturers (OEMs) for automotive companies, which has the potential to expand Garmin’s reach in that arena as well; that’s especially the case in Europe, which is one of Navigon’s strong geographical regions. Pending regulatory approval, Navigon will operate as a subsidiary of Garmin; that suggests that Navigon’s apps will stick around in the App Store even after the deal is completed. The combined company will face strong competition from other established players in the navigation industry, such as Magellan and TomTom, as well as from other corners like Google, who has integrated free turn-by-turn navigation features in its Android-based Maps application.